Pipeline Communications is a go-to marketing firm in the digital video and cinema production, video streaming, and broadcast technology sectors with 100 percent word-of-mouth client referrals for the past 20 years. Pipeline Communications is all about exceptional content creation and marketing. They have the expertise to place your message in front of the right eyes and ears in a compelling way that ensures you’ll Be Heard. Pipeline Communications helps its clients to “Be Heard” through a broad range of communication services. The firm came to Cision seeking a way to maintain its customer-centric approach with efficiency gains from centralizing its workflow and making it easier to quantify results. Pipeline Communications has a loyal B2B clientele which includes many clients who fall into niche industries, where more specialized research is required which require detailed media research. “We need to create strong vertical lists for these clients that update and supplement our existing contacts,” said Robin Hoffman, President of Pipeline Communications. Hoffman first tried Meltwater but quickly ran into issues. “We found out that our content wasn’t reaching everyone on our lists,” said Hoffman. 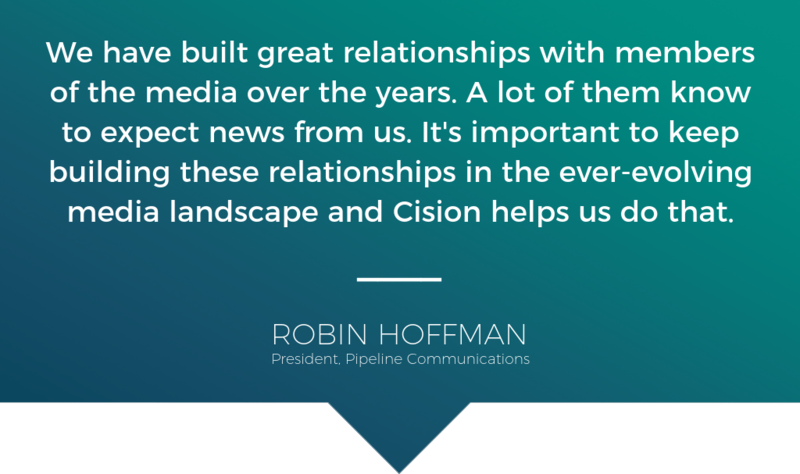 Hoffman turned to Cision’s Database and Monitoring tools, which allow the whole team to target media influencers, monitor campaign results and centralize email distribution efforts. According to research from eMarketer, 75% of brands say that identifying the right influencers is the biggest challenge to doing earned media campaigns the right way. Cision’s database provides instant access to nearly one million complete, dynamic and vetted influencer profiles. Pipeline Communications can stay up-to-date on both established professional journalists and their outlets, as well as new media influencers. Cision Database is integrated with an online news and Twitter archive, enabling users to search for recent content created by influencers. The Cision platform also allows Pipeline Communications to store their own media lists, and makes it easier for all team members to upload and send press releases while keeping track of list usage. Proving ROI through monitoring function: 81% of senior marketers believe earned media is more effective than paid. And more than 80% of consumers trust earned media more than owned and paid. Hoffman is well aware of this fact and knows the importance of proving ROI and reporting coverage to her clients. Her team compiles weekly clip coverage reports for individual clients using Cision. “Media coverage is still so important for us, alongside social and direct marketing,” said Hoffman. “We are very happy with our coverage, so, unlike with our previous provider, we know the content is being correctly distributed by Cision—and seen. Now that Pipeline Communications has covered the basics with their Cision platform, they want to explore other features available to them.